If you haven't modernized your self-storage rental agreement in the last five years, you are probably missing important components that need to be current in the industry. For example, many states have updated their self-storage statutes with new procedures for serving of default notices, disposing of vehicles, and selling tenant insurance. Provisions addressing value limits, limits of liability and prohibited items must be updated regularly. 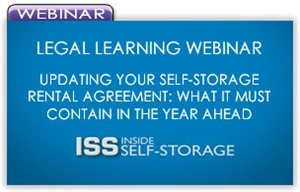 This webinar addresses the critical components of the self-storage rental agreement and the areas that should be updated for maximum protection against liability.